Throughout U.S. history, young men have been called for military service. From colonial times through the Vietnam War, eligible males over eighteen have been drafted. In 1973, the government ended the draft, replacing it with a “stand-by draft” for men and voluntary service for men and women. All males, within thirty days of their eighteenth birthday and continuing up to age twenty-six, are required to register with the Selective Service System. This rule doesn′t apply to women. Registration provides the government with a list of men to call up for service in the event of a national emergency. Failure to register is a crime with a penalty of five years in prison or a $250,000 fine. 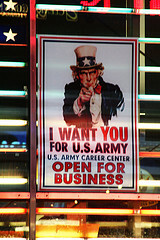 Men and women may join the army, navy, air force, marines, national guard, or coast guard. If you are interested in signing up for military service, contact your local recruiter. He or she will give you complete information about enlisting, including benefits, length of service, and education and travel opportunities. 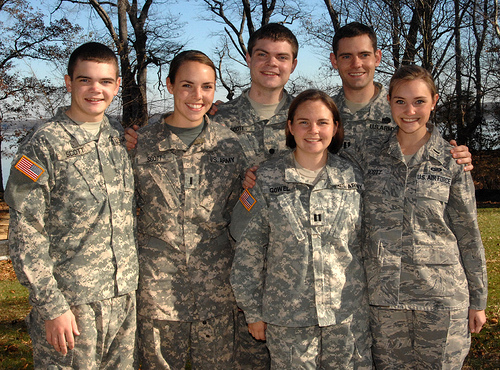 If you′re thinking of a career in the military as an officer, contact the Naval Academy in Annapolis, Maryland; the Air Force Academy in Colorado Springs, Colorado; or the Army′s U.S. Military Academy in West Point, New York for information. You may not be eligible to join the armed services because of your age. Not all branches will take you if you′re under eighteen, unless you have your parents′ consent or you′re emancipated.You may also need your high school diploma or GED certificate to enlist. Some branches won′t take you if you′re on probation or parole, or if you have a juvenile record. You may need to ask the court to destroy your record, which may clear the way for your enlistment. These are questions to discuss with your recruiter. Although women are prohibited from being “assigned” to direct combat, they are “attached” to male units in Iraq and Afghanistan since U.S. involvement in 2001. They have patrolled streets with machine guns, served as gunners on military vehicles, and driven trucks down bomb-ridden roads. Women make up 15% of America’s total military force, with 20,000 currently serving in Afghanistan. As of February 28, 2011, 137 female troops have been killed in these wars while 747 have been wounded. (Source: Department of Defense) For more on this subject, take a look at Upfront magazine’s article dated April 18, 2011. If, by reason of religious training or belief, you object to military training and service, you may be excused from active duty. A conscientious objector is protected by the U.S. Constitution and the Bill of Rights. You must still register with the Selective Service System, but you may be permitted to serve through noncombat civilian service. Discuss this with your parents before deciding what to do. Update: A report, released for the first time by the Army in December, 2010, indicates that 23% of high school graduates don’t get the minimum score needed on the enlistment test to join any branch of the military. Basic questions in math, science and reading are missed resulting in a smaller pool of eligible recruits. The Education Trust conducted the study of 350,000 graduates ages 17 to 20 between 2004 and 2009. An example of a math question asked on the Armed Services Vocational Aptitude Battery exam is: “If 2 plus x equals 4, what is the value of x?” This is a sad comment on the state of public education in America. Read more about the armed forces and registering with the Selective Service System. Why should i register when I’m 18,it’s none of there business whether or not i register.If drafting hasn’t been done in so long what’s the point.Just another way that the government tries to control people. Dear Samuel: You’re wrong about it being none of the government’s business. Federal law requires registration for every male between the ages of 18 and 26. Jail and/or fines are authorized for a person who doesn’t comply with this law. Currently, military service is based on a voluntary act by men and women. Since there isn’t a draft, you won’t be enlisted unless you decide to serve. I don’t think that drafting is right. If we want to be in the military, it should be our own choice.